Here is the first edition of Earthshine News. To subscribe visit the Earthshine web site and sign up. This is the first edition of Earthshine News, a newsletter published by the Earthshine Astronomy and Space Science Organization. Earthshine News provides information on the activities of Earthshine. The Mississauga–based Earthshine Astronomy and Space Science Organization was formed in 2003. Earthshine’s mandate is to promote astronomy, space science, and related sciences to the residents of the western Greater Toronto area. The purpose of Earthshine is to fund, build, and run an astronomy and space science facility in Mississauga to replace Toronto’s McLaughlin Planetarium. Since the McLaughlin Planetarium closed in 1995, we have been left without a badly needed astronomy and space science facility in the GTA. Earthshine has run a successful educational public outreach program at the Riverwood Conservancy since 2009 by partnering with the Mississauga Centre of the Royal Astronomical Society of Canada (RASC). Monthly public star parties are held on the green area in front of Chappell House. Several RASC members set up a number of telescopes to observe the Moon (observing evenings are scheduled around the first quarter lunar phase), a planet or two, double stars, and other objects of interest. If we are lucky, we watch a pass of the International Space Station. Attendance at these events varies, but is usually between 200 and 250 people. Over 3500 visitors have attended these events since they started. Earthshine has also partnered with the RASC to run evening programs for youth groups (Cubs, Brownies, Girl Guides, Scouts, and Pathfinders). The programs consist of a presentation that covers all the requirements for the group’s specific astronomy or space exploration badge. Earlier this year, the Earthshine Board of Directors decided to expand its programming and buy a mobile digital planetarium. Mobile planetariums usually consist of an inflatable dome approximately 6 to 8 metres across and hold 30 to 50 people. Earthshine will run a fundraising campaign on Indiegogo to raise the $100,000 needed to purchase the planetarium. Once successful, Earthshine will look for a temporary or permanent site to run planetarium programs. In addition to beautiful simulated star views, a planetarium can take the audience on virtual trips around the solar system and to other stars and galaxies. A planetarium can be used day or night, no matter what the weather, and entertains, educates, and inspires. 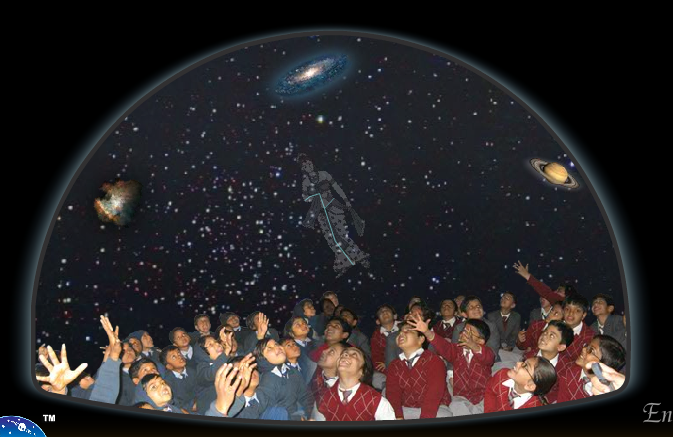 Of course, students of all grades will enjoy astronomy programming in the planetarium. Digital planetariums can now be used to present other science programming as well, such as biology, chemistry, environmental and earth science. This allows us to expand the school audience to all grades. Many existing planetarium shows on a variety of topics can be purchased. Until we find a permanent site, Earthshine will run programs at schools, community centres, and other sites. However, the Board of Directors feels that it is critical to ultimately find a permanent home for the planetarium to run programs. The fundraising program will start September 30, 2013. When several people give small amounts and then spread the word to friends, family, and contacts, the donations grow. We are looking for 1,000 people to support the planetarium project by donating $100, or 5,000 people to donate $20 each. During the campaign, which will last four to six weeks, we will run special activities, such as talks at libraries (see below) and sidewalk astronomy events; we will also distribute press releases to traditional media and promote the campaign using social media. Earthshine is a registered charity and can issue tax receipts for donations. The first $100,000 will be used to purchase the mobile planetarium along with some existing programming. The next $100,000 will be used to lease a facility large enough to hold the planetarium, a classroom, an activity area, and office space. Earthshine has produced a business plan that shows that with 20,000 visitors a year, the planetarium will break even. Earthshine will hire its first two employees to run these programs but will also depend on volunteer help to run the planetarium. When in operation, Earthshine will actively apply for various grants and seek donations to keep the astronomy program running and expand its operations. To promote interest in the mobile planetarium fundraising campaign, we contacted all 18 Mississauga libraries in July. Earthshine offered to run free evening programs consisting of a presentation on recent astronomical discoveries, followed by outdoor observing through telescopes, weather permitting. Volunteers from the RASC provide the telescopes as they do at Riverwood events. To subscribe to Earthshine News, go to the Get Involved section of this website.